Explore the new American West with six established landscape photographers as they share their favorite tips for shooting iconic images of the wilderness. In the mid to late 1800s, two things happened in the United States: photography gained traction, and settlers started to move West in search of gold and opportunity. Some early pioneers brought cameras and bulky glass plates with them on the difficult journey westward. Despite the extra weight, it was important to them to document this wild, uncharted territory they would soon make their home. Many of their photographs still exist today. Ever since, photographers have had a love affair with the American West; among them, Ansel Adams, Carleton Watkins, and William Henry Jackson. But today, perhaps images of these landscapes can take on new meanings. 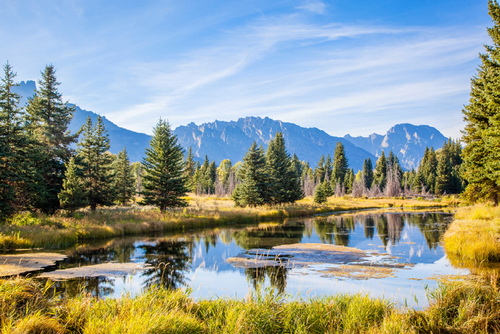 The Western United States are not as pristine today as they were in the late 19th century. But, they are home to some of our planet’s greatest natural wonders. For generations, photographers helped record and protect these untamed places. With luck, they will continue to do so for many years to come. We interviewed six talented photographers about their experiences and tips for exploring the American West. I took this picture on one of my many camping trips to Grand Teton National Park in Wyoming. 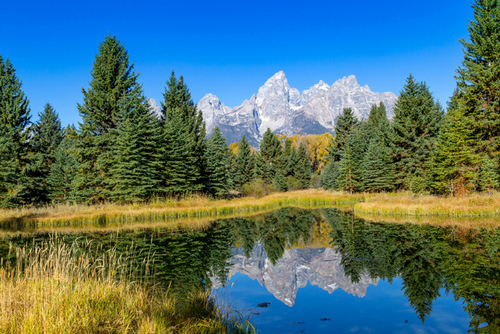 This is one of my favorite spots because of the reflection of the Tetons in the river. It is also a little out of the way, so it is less crowded and is a great place to see moose. I went there at least twice a day, at sunrise and sunset, for six days and nights. Finally, on the last night, I got the clouds that I needed to get that perfect sunset shot. I had to go well before sunset, scout out many different locations, wait for hours, and even move locations a few times as the sun was setting, but it was worth it. One of the most important tips I can offer to aspiring photographers is persistence. 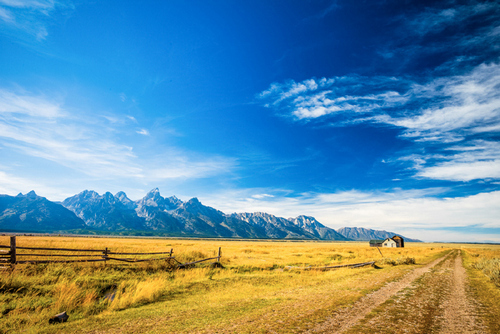 I am fortunate enough to live within a few hours of some very beautiful places, such as Yellowstone and Grand Teton National Parks, and I go to these places as often as I can. I think one of the most important things is to go out often and always be on the lookout for that perfect spot and that perfect shot. You have to be adventurous, and you have to be creative. Once you find a great spot that works, go back there often, in different seasons, at different times of the day. Approach things from different angles. Look for interesting pieces in the foreground, such as a tree, wildflowers, or an old wooden fence. Take hundreds and thousands of photos of your favorite spots, but always be looking for new spots as well. Get a truck with 4-wheel drive, and don’t be afraid to take some sketchy looking roads (just make sure you let someone know where you are going in case you get stuck.) Or park and haul your gear up a mountain that looks like it might have promise. It was my last day of shooting for this outing. I would later board an evening flight from Vegas and head home. So, I drove out to the East Rim of the Grand Canyon in the predawn darkness with freshly fallen snow all around. I set up at the overlook, then waited for dawn while a strong and very cold wind cut right through me from across the chasm. Zion National Park is a favorite place of mine. Later, as I traversed the flat desert of northern Arizona, I could see off in the deep distance what looked like sheets of rain falling on the red rock ridges of southern Utah. Then I realized that these sheets of “rain” were not gray but white. My mind grasped the significance instantly. 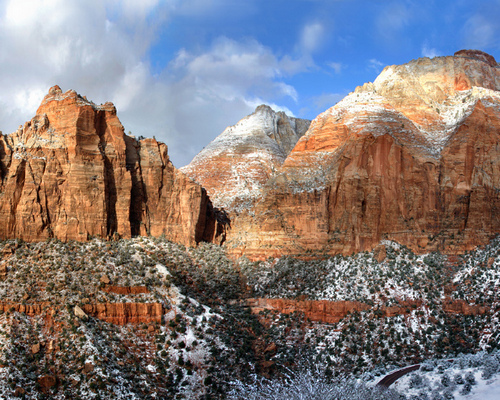 As I wheeled up into the Southern Utah elevations, I was surrounded by a gorgeous snowscape, particularly when entering Zion NP. Its trees were drooping with snow, its peaks displaying a color palette of whites along with its standard reds and golds. I had entered a winter wonderland… desert style. I research my major locations before heading out on a trip, and if I like a spot well enough, I return to it several times during my outing and whenever I return to the area again. This allows me to get to know a site very well. In some cases, the best images are gathered in the initial pass. But, in most cases, familiarity yields better results through time. The more visits one can make to a prime location, the more opportunity there is for encountering unusual and spectacular conditions. The American West will yield superb images on almost any given day, but add a fresh snowfall or low muscular clouds enshrouding a group of peaks, and you will assuredly score a transcendent result. I like this photo because it illustrates something about photography that is important no matter how talented you are: being in the right place at the right time. 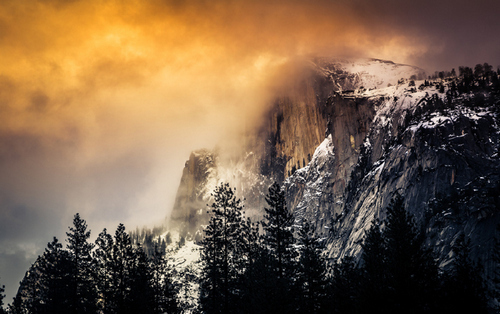 In this case, it was a short winter trip to Yosemite in January. I was simply walking through a parking lot after arriving in one of the villages, and I looked up to see this amazing cloud cover and light. I simply snapped a photo, hoped for the best, and when I went to process, I came out with a photo that my friends say looks like the background on a Mac computer. Well, I think any photographer would be happy to have one of their photos on millions of computer desktops. So many places in the American West have been photographed almost an infinite amount of times, so I suggest trying different perspectives or crops when you’re photographing. See if you can put your camera somewhere unique to capture a new view. For example, let’s say there’s a bridge that has the perfect view of a famous sight; instead of shooting on the bridge, try going under the bridge or going off to the side. You would be surprised sometimes about how much of a unique view you can get from just trying these little things. I went on a backcountry day trip in Cathedral Lakes in Yosemite National Park. The weather called for a clear day with a possibility of a scattered thunderstorm. The Eastern Sierras are known for unpredictable and rapid changes in weather, and this day demonstrated exactly that. I reached the Lower Cathedral Lakes about 45 minutes before sunset, and during the time I was pitching my tent, a thunderstorm rolled in. I took shelter inside the tent for no more than seven minutes, and, just like that, the storm was gone, leaving behind the high clouds above Cathedral Peak. Then I quickly ran around the lake to find a few ideal compositions. Golden hour brought fast and dramatic shifts in hues from blue to purple, yellow to orange, and then pink to the final blazing red as the sun slowly retired below the horizon. This photo is one of the many frames I took during that time. The most dramatic sunrises and sunsets are right after a clearing storm. Check the weather, and look for partially cloudy days and scattered rain/storms. I even go out when it’s overcast because there’s always the chance that the sun can peek through and create dramatic lighting during the golden hour. Dig deeper and check the hourly forecast to gauge the chances for dramatic lighting. It goes without saying, but be sure to carry clothing and gear to protect your camera and yourself from the elements. Bring insect repellent. 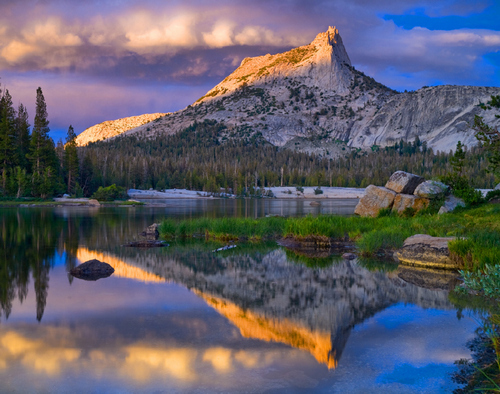 Mosquitoes are a hazard in the Eastern Sierras in the summer and even more so after the sun sets. 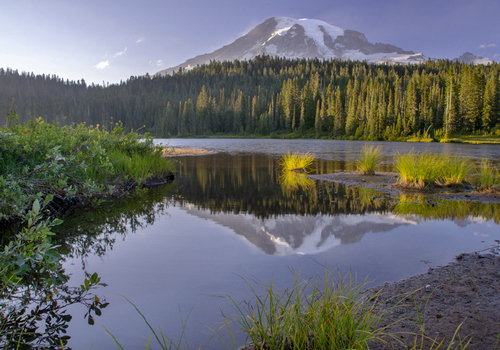 A good item to have to enhance your landscape photos is a Polarizing Filter. It adds more depth to the lighting after a clearing storm. I first noticed Ansel Adams’s photography as a teenager visiting Grand Teton National Park, and it was the first time a photograph evoked an emotional response in my heart. It moved me somehow on a deeper level than any image I’d ever seen before. I decided I wanted to try to replicate that moment in others with my photography. I discovered this narrow trickle of a stream out in the dirt pan of Death Valley. It wasn’t anywhere near the road. I just decided to park my car, grab my camera and my water bottle, and wander out into the wilderness about a mile and see what I could find. Odds were I wouldn’t find anything out there, but on that particular day, I did, and I couldn’t believe my luck. The biggest tip I can think of is to wander off the beaten path. Everyone has taken the same iconic images at Horseshoe Bend, in front of the Grand Tetons, or Tunnel View in Yosemite. I’m not saying you shouldn’t try your hand at those same locations. But, there are countless other spots that are waiting to be discovered at the end of a gravel road or dirt hiking trail. Take the time to explore a little in Google Earth, and then turn your car off the asphalt and just see where a new road leads. Maybe you don’t find anything special, or maybe you discover a vista, an abandoned cabin, or a hidden waterfall that only the locals know about. You’ll never find these places if you’re not willing to venture out and try. The American West is in many ways a world of its own. What it often lacks in historical depth compared to other places in the world, it makes up for in ecological diversity and untouched natural beauty. It’s these extremes that captivate the imagination and provide inspiration for me as a photographer. 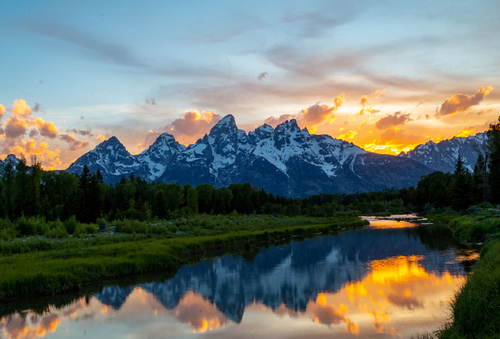 Jackson Hole and Grand Teton National Park are amazing places. I like this particular picture because of the prairie grass fields in the foreground, along with the old barn in the background. It was both dramatic with the mountains and peaceful at the same time. The road almost felt like it led to nowhere, and the sky seemed bigger than normal. This photo was taken by getting off the beaten path and wandering around a little. The first is lighting. Not surprisingly, sunrise and sunset most often provide the best lighting for me, and waking up early usually gives me a rare view of the world. I also find that staying out a little longer after the sun has set also gives me some pretty interesting monotone shots. The less obvious factor is cloud cover. When I first started photography, I hoped for clear blue skies, but after a while, it became hard to differentiate between my work and others. I found that partially cloudy days added a nice depth and often changed the colors in the sky. Using a graduated filter can produce some cool shots. The second is perspective. Finding a unique perspective isn’t always easy, especially at well-known locations. Occasionally, I have tried taking helicopter tours to get a different view, but they aren’t always available. Shooting into the sun is another trick I have tried, and that has yielded some interesting photos. It’s always scary doing this, and I always hear my photography teachers lecturing me about damaging my sensor, but I try to be fast, and I have found the results often outweigh the risk. Most of my photos come from road trips I have taken, and, quite often, finding a unique perspective just means slamming on the breaks, backing up, and getting out of the car to take a picture. Other than that, it comes down to just doing research by going online, looking for less popular locations, and seeing if there are any photos taken of areas that I think are underrepresented. The third and final variable is the season. I find that planning my trip at the right time of year is key, and I often use the PhotoPills app to do this. An intriguing discussion is definitely worth comment. I believe that you should write more on this topic, it might not be a taboo matter but generally folks don’t talk about these issues. To the next! Cheers! !